The world is undergoing the largest wave of urbanization in history. More than half of its population now lives in urban areas. On the one hand, cities are centers that promote and support economic growth. On the other hand, they present high levels of social, spatial and economic segregation. Due to highly dynamic migration processes into cities, people from numerous origins and cultures have to face the situation of living together. Therefore, new, innovative ideas are needed to address the new challenges that come with the urbanization process. As a result, art has emerged as one more tool to address urgent social problems such as segregation and violence. Different artistic projects around the world have proved to be a powerful instrument to revitalize, enrich and rethink urban spaces. Injecting art into urban transformation processes has been an innovative mechanism to transcend the boundaries of urban planning. An example of art being used to address social challenges is taking place in Sweden, a country that in the last two decades has experienced two major and dynamic processes: immigration and population growth, which in turn have brought significant cultural and social phenomena. Segregation is one of them. As a reaction, artistic approaches have been materialized in Sweden as a tool to transform its cities, enabling communities to criticize current systems and imagine new social structures and spaces. This is the case of Malmö, Sweden’s third largest city, where 41% of the population has a foreign background. The growing distance between the different groups comprising the city has resulted in both governmental and bottom-up initiatives that seek to respond to the social segregation phenomenon affecting the city. 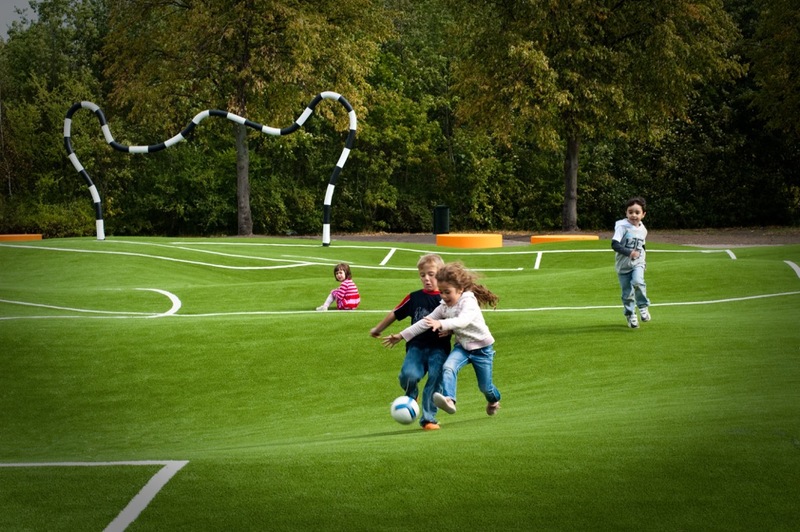 The world’s first Puckelboll field in this city is an example of these initiatives, and was born with the aim to provide a new space to foster social and urban transformations. This project is a strategic bet to build bridges between communities, and promote urban inclusion through art. 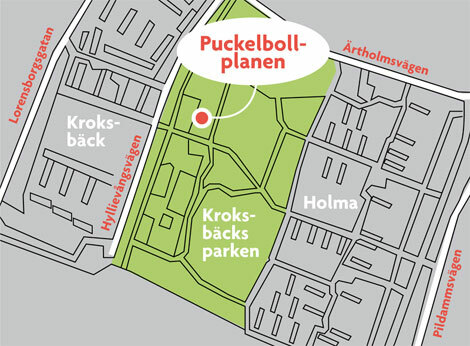 The Puckelboll field is located in a park called Kroksbäcksparken, which is surrounded by two neighborhoods: Holma and Kroksbäck. For the last few years, this area of the city has undergone social problems such as crime, unemployment, segregation and social exclusion. 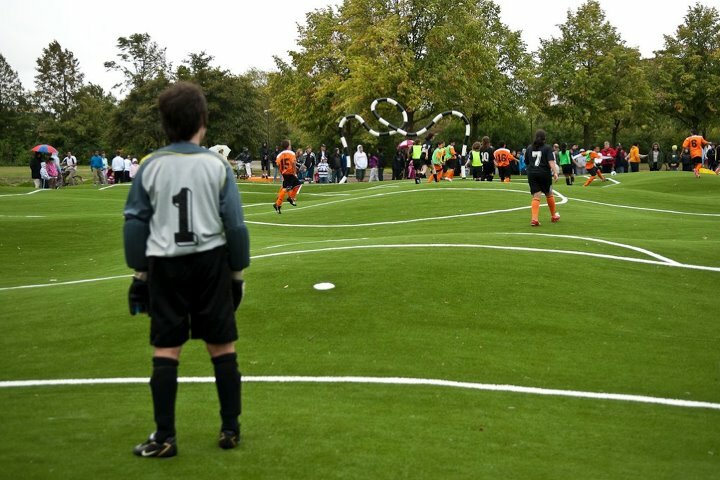 A firm commitment was made by the city’s government to combat these issues and, as a result, the Puckelboll field took off in 2009 as an urban project directed at encouraging the interaction among the residents. 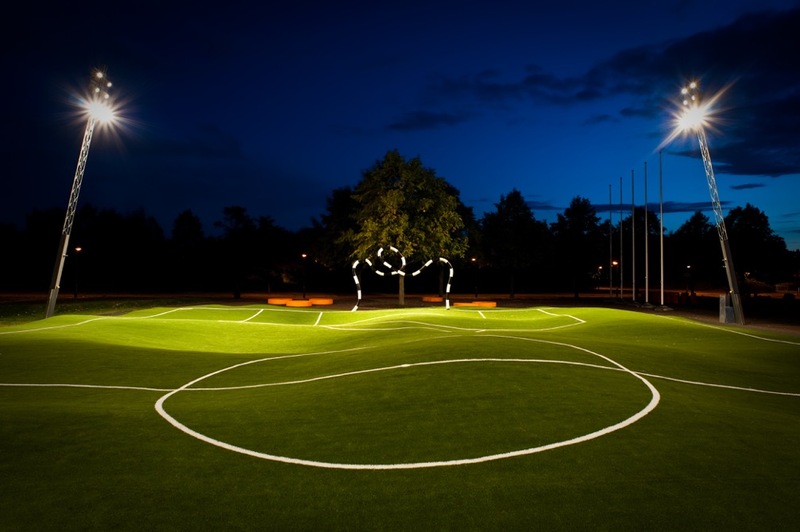 The Kroksbäcksparken park, where the Puckelboll field is located, was established in the 1970s, when Kroksbäck and Holma were built. Kroksbäcksparken is part of the Pildammsstråket plan, which covers an important green area of around sixty hectares. This urban plan developed and commissioned in 2005 by the Traffic Department of Malmö, aims to provide a comprehensive picture of this vast green area of the city and to give suggestions on what this area should contain and what character it should have. The main goal of this plan was to shift the development of this green area from a motorway perspective to a more inclusive and integrated perspective of the spaces that intersect it. The plan divided the area in different zones and provided a basis for further work in each of them. Credits: Area covered by the Pildammsstråket urban plan, in Malmö. 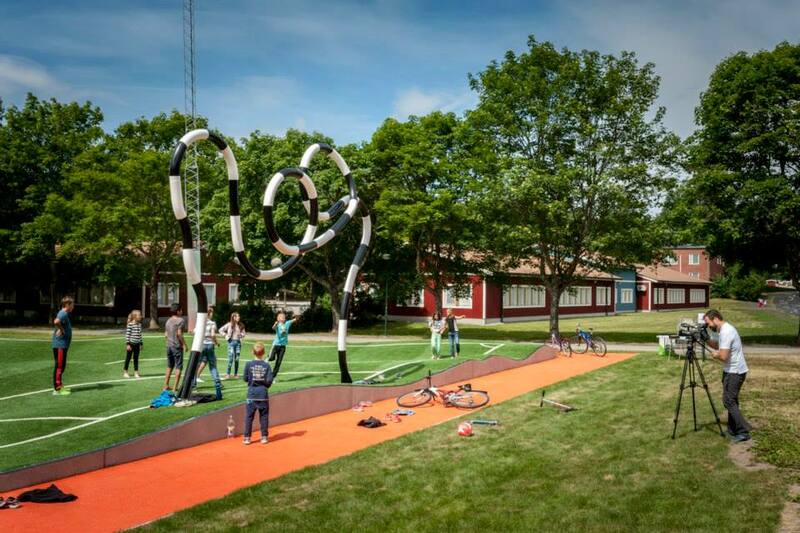 Image from the website of the City Hall of Malmö Different projects have emerged after the plan was developed and the Puckelboll is one of the proposals to revitalize this area. 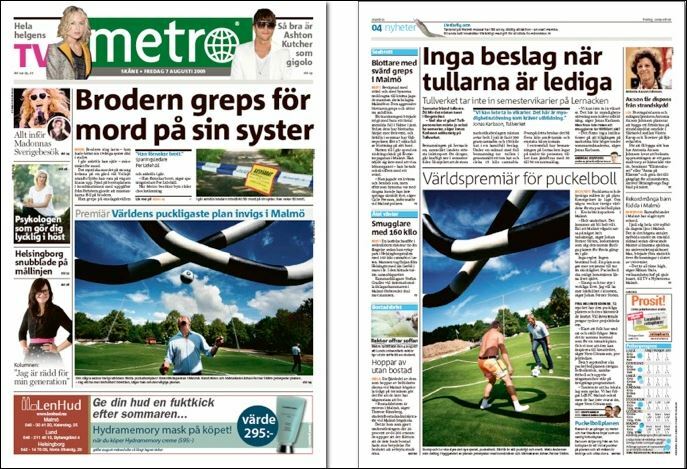 Johan Ström, the mind behind the Puckelboll idea, shared his insights about the emergence of the project and the impacts it has had on the society. Marcela Pizano (MP): What is the history behind this project and what was your role in it? Johan Ström (JS): I am the artist, designer and author of this project. 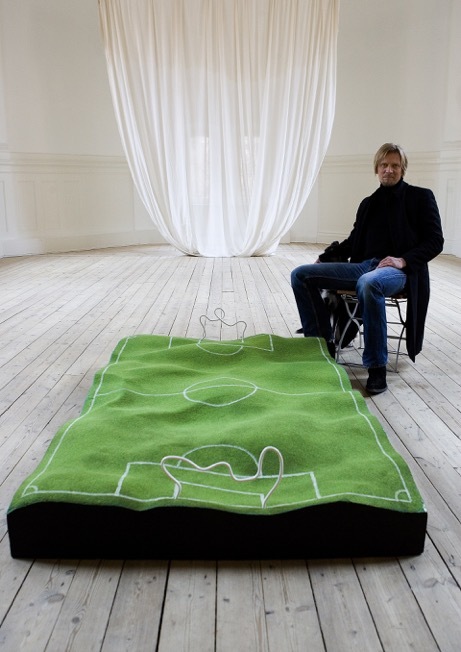 The Puckelboll was thought from the very beginning as an artistic impression of a global phenomenon: football, a sport practiced by many people around the world regardless of their age, gender, religion, social background or economic conditions. It is therefore a phenomenon that engages, inspires and invites people to dream. Everything began some years ago, when I walked by an artificial turf field being built in my neighborhood. About seventy meters away there was a similar field, something I personally felt was not necessary. Why don’t we think of diversifying these urban spaces? Could they be transformed into something artistic and attractive? 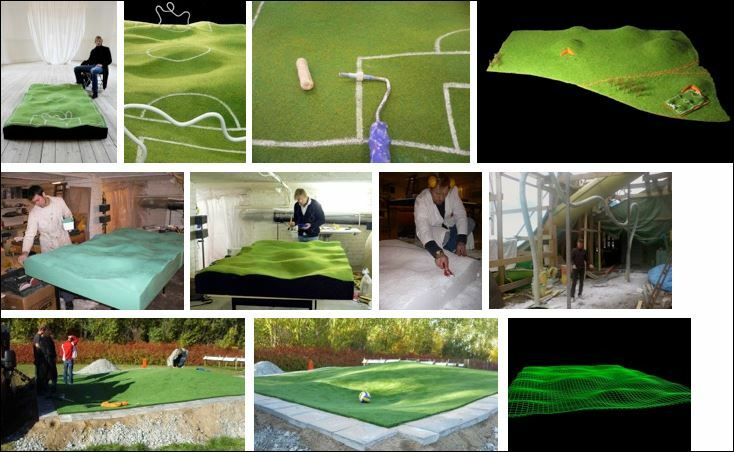 I started to think about these questions and to analyze how a football field is actually designed. This space is thought as an equilateral area. The goals are also equal and the lines on both sides of the field are parallel. A football field is a fair and equal space. But life itself is not really fair or equal. Problems such as elitism, exclusion and physical conditions put a spoke in the wheel for many people. Life is simply not fair. So the idea of the Puckelboll is to provide an unfair playground, designed so the ball never bounces in the direction people think it will. The field is not symmetrical, its halves are not equal either, and the goals do not have a “top-corner.” This is a reflection of how I would define life if it were a football field. After working and designing the Puckelboll for some time, I got in contact with the municipality of Malmö and I showed them the project. 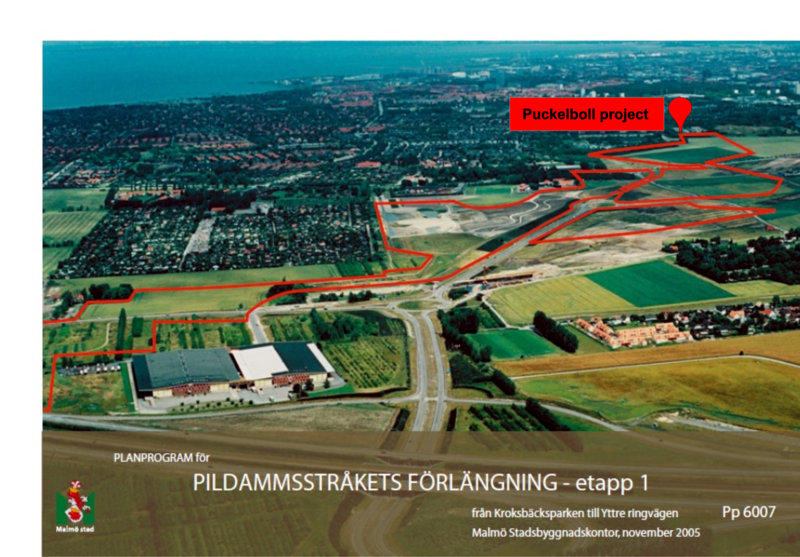 After this meeting, the Puckelboll concept was approved and the city decided to build the new field. MP: What was your impression of the social conditions in the area and the interaction among its inhabitants before the project was built? JS: Kroksbäcksparken is a park located in a relatively segregated area that has experienced some social problems (1). Due to these problems, there has been tension between the two neighborhoods located on either side of to the park over the last few years. At night, the park was perceived to be unsafe. 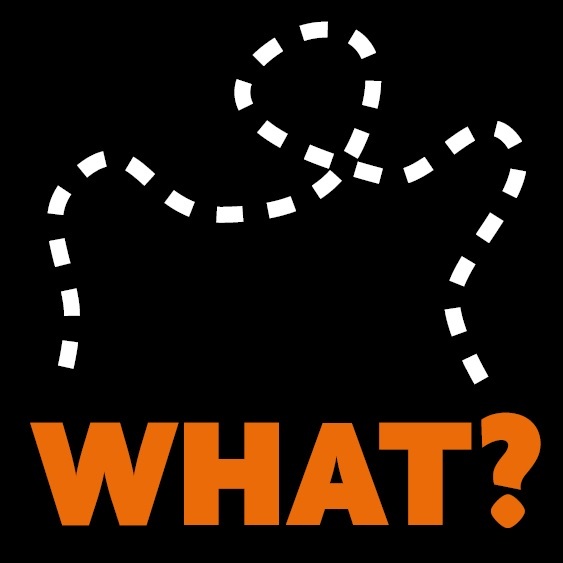 The municipality has been trying to find ways to revitalize the area and include different interesting objects that would make the park attractive to the surrounding communities and to other areas of the city as well. 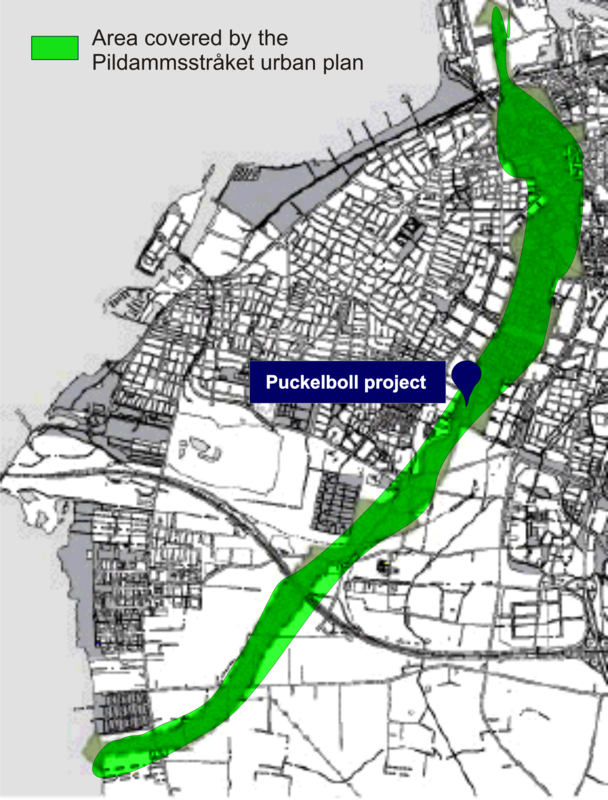 In that sense, the Puckelboll project fits like a hand in a glove. 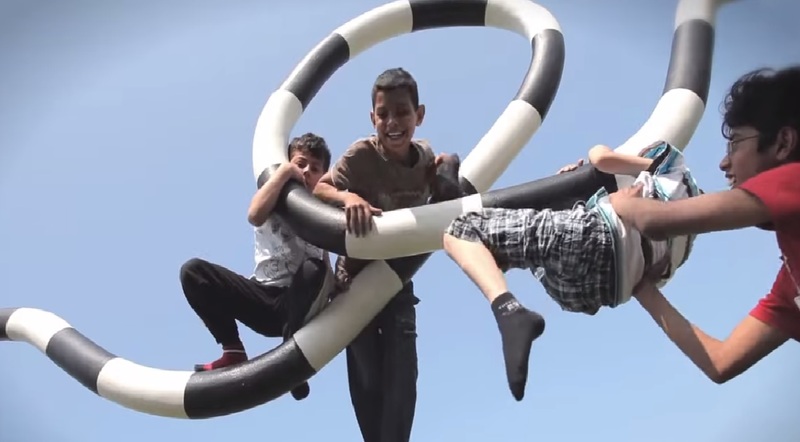 Puckelboll is an interactive piece of art that carries a philosophical message. It provides an environment through which social tensions are reduced. It was thought as a space that stimulated social integration; that created a sense of belonging among the residents. I have experienced some amazing moments with residents from this area. Valuable and fruitful meetings have taken place between different actors, which has been a fantastic experience. From my perspective, the social interaction process that emerged from this project has been an interesting phenomenon. 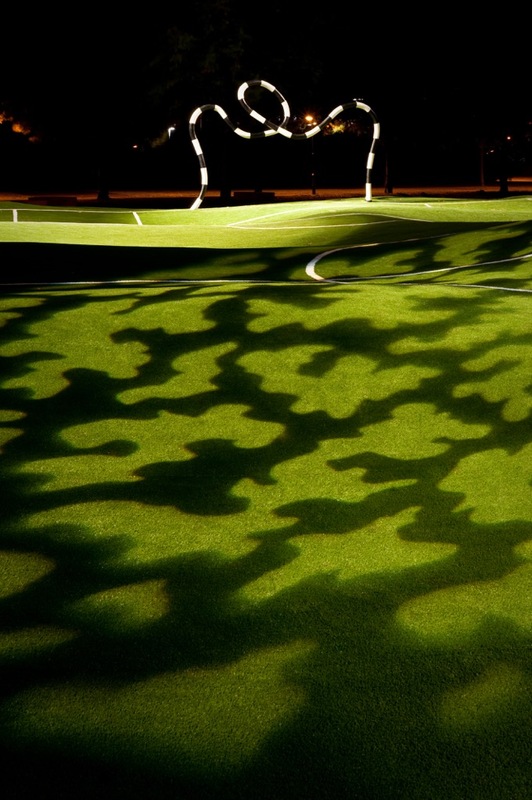 MP: What were the main ideas, inspirations and goals for the Puckelboll field? JS: As I mentioned earlier, the first idea was to make a piece of art, a sculpture of the Puckelboll, as a reflection on the current situation around me. I started to wonder if this sculpture was either a way of expressing my beliefs through an object or the beginning of a new artistic movement. I realized that through this project it was possible to reflect on how to socially and physically transform a space through art and, subsequently, on how to contribute to the urban planning process. As a result, the project became something bigger than just a sculpture. MP: Useful and enjoyable spaces in cities are an essential requirement for liveability. Studies have shown that the experience of interacting in a nice place is strongly correlated to happiness and safety. How important has this project been for the revitalization of this area? JS: I think people are highly perceptive when innovative ideas and attractive designs are presented to them. The key to the transformation of an environment is to respect people’s needs and expectations. What I have seen in this case is a sense of pride that has increased in the area as the communities around it began to embrace it. The Puckelboll is the “odd bird” of the neighborhood and people from other neighborhoods and the media have focused their attention on this area, which has in turn helped the revitalization of the park. I believe that all people usually react positively to the idea of being recognized. In this case, there was an area that deserved attention. Residents express satisfaction with the project. It evokes and inspires public support and a feeling of togetherness. This is a remarkable example of how artistic approaches offer platforms to make sense of our individual and collective experiences within the urban environment. The artistic realm is then a sphere that should be further exploited. The merging of urban planning and art provides interesting milieus that go beyond the aesthetic appearance and could contribute enormously to social transformations. Can artists help us rethink the cities of the future? In the next post, the second part of this interview will be presented. The outcomes and challenges of the project will be explored, as well as how this initiative has permeated the planning process and has been adapted in other cities. (1) The neighborhoods of Holma and Kroksbäck were built in the scope of the Swedish Million Program, which lasted from 1965 until 1975. According to a study from the University of Malmö, about 72% of the population in Kroksbäck and 75% in Holma have an immigrant background. 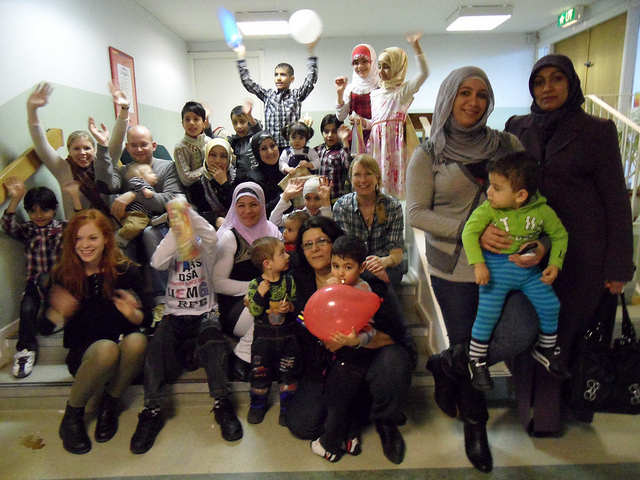 Since then, a lack of social capital and trust and other factors such as poverty, crime, unemployment, social exclusion and therefore a lack of taking part in the Swedish society, have characterized this two neighborhoods. Marcela Pizano Castillo She is a Colombian Architect and holds a Master’s Degree in Development and Urban Planning. She worked for three years for the Department of Planning of the city of Medellín. During that period she was in charge of reviewing and approving urban projects related to transportation, public space, urban amenities, etc., after working directly with the communities involved. These kinds of projects were mostly performed in the poorest areas of the city. After concluding this period of her professional life, she lived in Barcelona and there she studied a Master in Urban Planning and Development focused on the transformation of cities in developing countries, at the Polytechnic University of Catalunya (UPC). Afterwards she moved to Sweden where she studied an advanced course in architecture called “Radical Shift, Incremental change: Rio de Janeiro” with the aim to explore current urban strategies and how they are affected by the global agenda. Currently, she is studying a distance course called “Feasibility Assessment of Urban Projects” at the Polytechnic University of Catalunya (UPC). Her plans are to return to Colombia and continue working on the transformation of cities.